Godly Play is a Montessori-based church school curriculum. Children are encouraged to play through sacred stories, liturgical actions, parables, and silence. Sunday School classes run from mid-September to early June. We offer many youth and family events throughout the year so please check the calendar often! This class is an introduction to the core lessons in Godly Play. Children are introduced to a lesson and then increase their grasp of the ideas through time wondering about it and self-directed play. The spiraling curriculum of Godly Play encourages children to develop a deeper understanding of the Bible stories by connecting them to their own lives. This class’ lessons and enrichment activities look at how each child belongs to the sacred stories and parables. 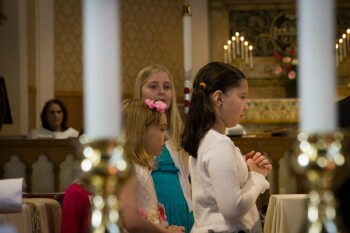 Children also discover how they can participate in the liturgical duties of the church. Older students continue their understanding of the connection between their own lives and the stories of the Bible. There is also a focus on living in a fragile world including lessons on how modern science and religion can co-exist. St. John’s Church follows the Safe Church policies of the Diocese of Western Massachusetts.